There is nobody I would rather journey to the kingdom with other than with you, these last 26 years. So, your pastor, your spiritual leader, must go on retreat every year, usually for eight days. This year we went to the Trappist Monastery of Assumption Abby in Avery, Missouri. It’s way down very close to the Arkansas border about 100 miles from Springfield. This monastery is on a plot of 1500 acres. It is rocky, hilly, beautiful, but truly way, way out. There was no phone connection with your cell phones. If you tried to call me, nobody answered because there were no phone towers. Of course, that is conducive to letting go of all the busyness that I am involved with in my ministry to you and all the people in the community that come our way. It is very necessary to go apart. I have been doing this with Fr. Don Buhr for 51 years. Truly I have a soul mate in which every year we make an 8-day retreat reflecting on God loving us, our loving God and how to make that intimacy grow in deeper and deeper union. That is what I was about, and it is so necessary that I just be still and reflect on the way the Lord loves me and I love the Lord. Praying for insight through the sacred scriptures, what I usually do is what we call Lectio Divina, divine light of the scriptures. I do four periods of about an hour. I took Saint John’s gospel and meditated each day on different chapters, four times a day. The rest of the time I spent walking around, praying, being in the chapel, reflecting on just being in union with the Lord, stillness and letting myself be open and letting the Lord talk to me which I really felt He did in little ways. So, I begin my 80th year in this wonderful blessing of fairly good health and insight to continue on in a happy, joyful spirit of wanting to love, love the Lord and all His people. In my reflection I would write a little bit down of these insights. Also, I had a casual feeling of just being in the Lord’s presence, letting Him love me and letting myself love Him in return. Doing these eight days it truly does lead one to that closer walk with the Lord. It is very necessary, as I am the shepherd of the flock, that to love you is the most important thing I can do to let the Lord love me and let Him use me as an instrument in helping you, leading you in your journey. This is really a journey of trying to be closer and closer and in union with the Lord. Lots of stillness, lots of prayers challenged me to put the Lord in the very center of everything that I do with good insights on how to do life better and live more holy. Dear church family, you that I dearly love, I am glad I took this time apart so that you and I can be all the more in love with our Lord and feel Him loving us. With this we are challenged to go out and love especially even more in our relationships. So that’s what happened on this retreat. We had pretty good weather which was nice, a little cold, a little rain coming and going and snow on the way back, but it didn’t stop us. I was the navigator and we got lost on the way down, but I was really good at getting my dear brother, Fr. Don back whole. We stopped off for a banquet to celebrate our desire to be totally in the Lord’s hand. Alleluia! I felt many times as we talked two Sundays ago when I told everybody, when I am happy I say, “Alleluia! Praise the Lord.” My brother, Fr. Chris, says, “Yike”. We all want to give God all the glory and honor. Amen! Alleluia! That’s what your pastor was about. P.S. Of course everyday Fr. Don and I celebrated Mass, sang hymns and reflected on the Sacred Word of the day each taking a turn at preparing the sacred literacy and of course I had an intention of praying for each and every church family member on the list and anybody else I could think of as I went through. I was also praying for our troubled world and being challenged to dig into the messy world of encouraging and helping people with all their struggles. Again, Alleluia praise and thank the Lord! Yike! I invite all parishioners to take this opportunity to share the spirit of Christmas with others in need. Certificates for baskets will be available Sunday, November 25 and December 2. Baskets must be picked up on December 9 at Covenant House, 1-3pm at Maffit/Kingshighway. Please limit yourself to no more than five certificates. Please bring the name and address of those receiving baskets when you get a certificate. 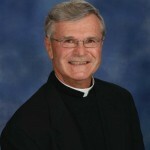 After unity Mass on December 2, we will have anointing with Friar Ed Mundweiller. I am trying to find someone to help with confessions on December 16 at both Masses.